You can create reports from selected drug pipeline databases (R&D Focus) on Ovid using BizInt Smart Charts for Drug Pipelines. Medline, Embase, and Biosis results are supported in BizInt Smart Charts for Patents and BizInt Smart Charts for Clinical Trials, beginning in Version 4.0. Instructions for creating charts from biomedical literature on Ovid can be found here. Chemical structure images are not exported. 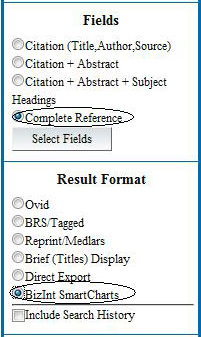 Include: check "Link to External Resolver" and "Include URL"
Click "Export Citations" to create the export. You can either Open the export directly in BizInt Smart Charts for Drug Pipelines, or save the .cgi file and use File | Import in BizInt Smart Charts. If you choose Open: If your system is not configured to automatically open BizInt Smart Charts files, you will see a browser dialog box should appear, asking if you want to Open or Save the file. 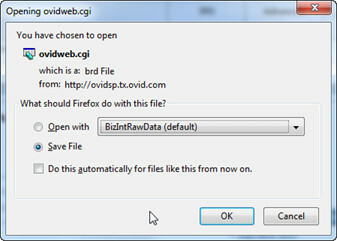 You may save the file (in which case you need to Import the file into BizInt Smart Charts), or you may choose to Open the file. BizInt Smart Charts should launch automatically, showing a dialog box reporting how many records are being imported from each database. Note: you may have problems exporting the records in BizInt format after saving the results to a folder on My Workplaces. If so, export directly from the search results as shown above. In Ovid, select the pipeline databases to search and conduct your search. 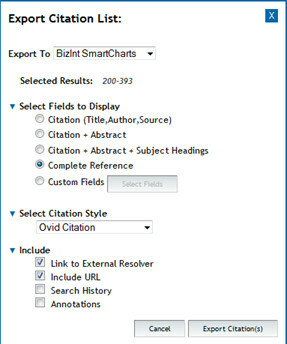 If you don't see a "BizInt SmartCharts" option under Result Format, contact your Ovid account rep to enable this option for your account. If your system is not configured to automatically open BizInt Smart Charts files, you will see a browser dialog box should appear, asking if you want to Open or Save the file. You may save the file (in which case you need to Import the file into BizInt Smart Charts), or you may choose to Open the file.